Shanghai is served by 2 airports: Pudong International Airport and Hongqiao Airport. As international hubs, there are regular and direct international flights between Shanghai and top European and USA cities. Pudong International Airport is located in the eastern part of Shanghai, about 30 kilometers from the center of the city and 40 kilometers from Hongqiao Airport. It covers an area of 40 square kilometers and is the main hub for national airlines China Eastern Airlines and Shanghai Airlines. Other international airlines that reach here include Aeromexico, Ari Canada, Air France, Air India, Air New Zealand, American Airlines, British Airways, Delta Airlines, Emirates, Finnair, Japan Airlines, KLM, Lufthansa, Qantas, Qatar Airways, Singapore Airlines, Turkish Airlines, United Airlines, Virgin Atlantic, and many more. There are 2 main passenger terminals; a third passenger terminal is planned to be completed and open in 2015. This expansion, much needed because this airport is the 3rd busiest in China behind the international airports of Beijing and Guangzhou, will increase its annual capacity from 60 million passengers to 80 million, along with an increase in freight handling. Hongqiao Airport is located in the west of Shanghai, about 13 kilometers from the city center. This airport is the main hub for domestic activity, with limited international routes. Hongqiao Airport treats more than 8 million passengers every year with its waiting room made of 15 waiting halls, 18 VIP waiting halls, and 15 luggage transmission systems. Just behind Shanghai Pudong International Airport, Hongqiao Airport is the 4th busiest airport in China, with 22 airlines serving 82 destinations. 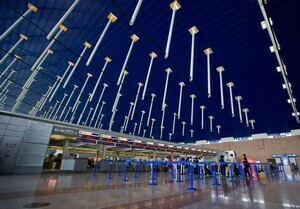 as of 2010, the airport opened an expansion project which included a 3,300-meter second runway and the new Terminal 2. Today, Hongqiao is able to assist more than 40 million passengers per year. The 2 airports are connected by a "guest road" (A1 Road) and the beltway (A20 Road) of Shanghai, both of which takes 45 minutes by car.